Theresia Hvorslev was one of a group of talented students of the well- known goldsmith Sven-Arne Gillgren, who was chief designer at the Swedish company GAB (G Dahlgren & Co.). After graduating from Konstfackskolan (University College of Arts & Crafts and Design) in Stockholm, she apprenticed at Georg Jensen in Copenhagen and at Bernadotte & Bjørn, the design studio of Sigvard Bernadotte and the Danish architect, Acton Bjørn. InternationalAwards. After working in Germany and Denmark from 1955-1960, Theresia returned to Sweden and her home town Lidkøping, where, in 1964, she started her own workshop. In the early 1960s she also began her highly prized work as a designer with the companies Alton and Mema. Her early designs are characterized by plain reflective surfaces and wing shaped forms which express the character of the metal. 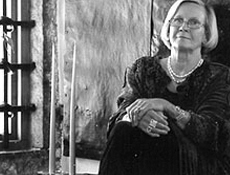 Among Thersia's later projects are small silver sculptures made for the Swedish royal family, as well as a large sculpture in steel placed in her home town Lidkøping. Her most widely used design is a set of cutlery made for the SAS (Scandinavian Airline System) and used by them for over thirty years.